About Clive F. Message Clive F.
We had two fabulous days with Clive. He was extremely helpful. Clive is amazing, knowledgeable and very accomodating to the traveler's interests. TOUR GUIDE RESPONSE: Thank you and glad you enjoyed your trip. See comments from the December 20th rating. Clive was an outstanding tour guide. His vehicle was prectically new and was sparkling clean. Clive was very knowledgeable of all the sites and always knew the best routes to take to minimize delays and maximize our time. He was well versed in the history of South Africa and of the current events happening in the country. He was always flexible and respectful of our time. We would use him again without reservation. TOUR GUIDE RESPONSE: Thank you for your comments and I'm so glad you enjoyed the day. It was lovely meeting all of you. TOUR GUIDE RESPONSE: Wow, thanks for all that. It was very interesting traveling with you and Marc and I enjoyed your good company. Thanks for the pictures and a Happy and healthy New Year. We had a wonderful day with Clive on our private tour as we visited a Cheetah rescue, drove over to Spice Route and then participated in our Malay cooking class. He was a wonderful guide, very informative and knowledgeable. This was our first full day in Cape Town and he introduced us to a variety of activities and sites that not everyone gets to enjoy. Thanks for a great day!! TOUR GUIDE RESPONSE: Hi there, Thank you for your posting and I know you have been travelling. I've forwarded the 'recipes' and glad you enjoyed our trip together - it was fun. Clive showed our group of 14 a fabulous day in the winelands and Cheetah Sanctuary. He is so friendly and passionate about his country. We can't wait to return and spend another day with him. TOUR GUIDE RESPONSE: Thank you for that and hopefully next time it will be for a few days. Really nice meeting you all. Clive was prompt picking us up. He took us to the botanical gardens, which were amazing, up Table Mountain, and to the Jewish Museum, as well as to a bird and wildlife sanctuary. We had lunch in Hoek Bay, sitting at a table with a direct view of the beach and the beautiful water and waves. Clive provided relevant background for all the sites. He is a safe and careful driver . We enjoyed our day. TOUR GUIDE RESPONSE: Thank you for your kind remarks and I wish you a safe journey for the rest of your quite extensive trip. Warm regards. 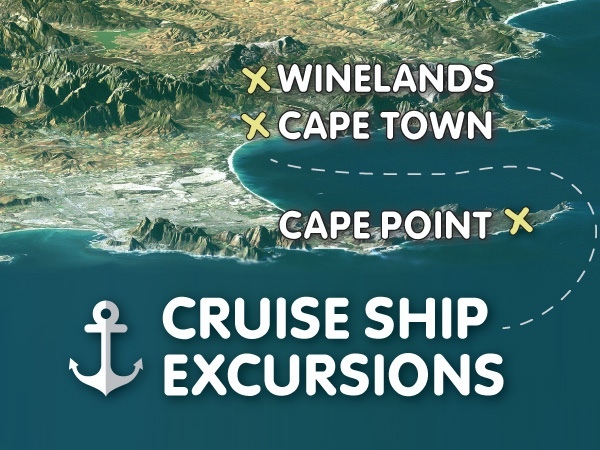 Clive has an amazing breadth of knowledge on the history, culture and geography of Cape Town and the surrounding area. He took care of ever detail, tickets, entrance fees etc. He was welcoming, friendly and adapted the tour as our needs developed - like touring with a friend, thank you for a great day out! Margaret and Craig UK. What a great day! Clive was very accommodating in his suggestions and activities. Great tour. TOUR GUIDE RESPONSE: Thank you again for this great response and hopefully the piece of art you selected will remind you of beautiful Cape Town. Take care and pleasant travels. We found Clive knowledgeable and helpful. We enjoyed our day with Clive and recommend him. TOUR GUIDE RESPONSE: Thank you for taking the time to comment and appreciated. Clive was an amazing guide for our family (grandparents, kids and grandkids) trip to Cape Town. He paced our sightseeing day according to our interests and always managed to avoid crowds at popular sights. His commentary was very interesting with pearls for the rest of our stay. My only regret is that we ran out of time and weren't able to do his cooking tour--guess we'll need to come back! We all, kids included, highly recommend touring with Clive; we feel like we saw the Cape with a friend. Many thanks! TOUR GUIDE RESPONSE: Thank you for your kind words and i'm looking forward to your next trip. It was lovely traveling with the family and such good kids. Warm regards to all. TOUR GUIDE RESPONSE: Thank you and I'm so glad I could help with your specific interests. I do look forward to meeting you again and take good care of your health. TOUR GUIDE RESPONSE: Thank you for your lovely comments. It was unplanned but worked for us and I really enjoyed traveling with you. I have read your private comments and agree that it is a little difficult with communications. Take care and start to plan your next visit. Great tour. Clive is personable, and very knowledgeable about the region. We went to a cheetah refuge in Paarl which was wonderful and two boutique wineries in the Stellenbosch region that were beautiful with great wines. Followed up with a visit to Van Rhys brandy distillery. Clive is very flexible and is willing to adapt his tours to your particular interests. TOUR GUIDE RESPONSE: Thank you and great that you enjoyed your day. Compliments for the Festive Season. We had a wonderful day with Clive. We had just one day to tour Capetown and Clive was very flexible with the schedule. Our goal was to get a flavor of Capetown and its culture. We visited the townships, wine country and a cheetah rescue and then drove around town. Clive shared his knowledge and expertise and answered our many questions patiently. He is a fountain of knowledge and we achieved all our goals for the day. Highly recommended! We were first timers to Cape Town and wanted a first day general tour to acquaint us with the city so we could learn and spend more time with places we found interesting in our following three days. Clive delivered. He was responsive in booking our tour, offered options and was very knowledgeable and energetic. Our tour day was rainy and he adapted very well with a solid Plan B. We are a 65+ fit couple and Clive was going strong as we ended our very full day. Thankyou. We had a wonderful day with Clive, he is knowledgeable, very helpful, good driver and all round first class. Highly recommended. Any one wanting a tour in S.Africa should be very happy with Clive. TOUR GUIDE RESPONSE: Thank you for your lovely comments and taking the time out to do so whilst you are still touring. It was lovely meeting you especially as we were once "neighbors" I wish you both a safe and wonderful cruise. And lots of good health. Clive was an incredible tour guide and was extremely knowledgable. He was very accomodating and stayed late with us due to traffic and just modified the tour where he needed. We loved our day with Clive and would highly recommend him! TOUR GUIDE RESPONSE: Thank you for your lovely comments and it was lovely traveling with your family. Pity it was only one day, but we never know. Warm regards to all. By far, Clive is the absolute best tour guide we've ever had. He anticipates your needs before you know you need them! Knowledgeable, friendly, accommodating, flexible and more. You won't find anyone better. But beware. Clive ends up to be a friend you hate to leave by trip's end. Thanks, Clive!! We hope to see you again soon. You've been amazing! TOUR GUIDE RESPONSE: You guys are terrific and it was a real pleasure traveling with you. Thank you so much for your wonderful review which might make it difficult to get a booking with me next time around. Enjoy the rest of your trip and a safe journey home. It could not have been a more perfect day. Clive collected us in a very comfortable, and immaculate, minivan and took us to Seal Island, Hout Bay, Harbor House for Lunch, Cape Point and back home via Chapmans Peak. The entire day Clive entertained and educated us with the history and insiders knowledge of the region. It was fascinating, relaxed and fun. Clive has the perfect balance of flexibility, professionalism, fun and is an expert guide. Thank you Clive. TOUR GUIDE RESPONSE: Thank you kindly for taking the time again to post these wonderful remarks. I am really gratified that you enjoyed your day. Until next time !!! We had a fabulous day and Clive was very personable and knowledgeable. TOUR GUIDE RESPONSE: Thanks again and sorry we never had more time to explore. But we have to leave something for next time. I appreciate you taking the time for these comments, really a help. Warm regards to all. Not only was the food delicious the host and chef were so fun and entertaining - the bonus was meeting several other travelers from other countries to cook and dine with. Fabulous experience. TOUR GUIDE RESPONSE: A real change from the usual restaurants and I'm so happy you enjoyed it too. I will be sending you the Recipes as promised so you can keep up with the cooking. We had a wonderful day - it was nice to have a plan but yet not a structured day - we had the ability to stay as long as we wanted, pass on sites if not interested and make up the day as we went a long - Clive is so flexible and the hospitality he showed us was endless. TOUR GUIDE RESPONSE: Thank you for your time and praise you have given. It worked well for us and meeting you guys was a treat. This is the way to get an introduction to Cape Town - to walk and ride around the city. To learn some of the culture and history as well as see the sites and of course add in some local shopping was a treat too. Clive is the best tour guide ever! TOUR GUIDE RESPONSE: I'm so glad the Day tour worked so well and thank you for your kind comments. It was a good way to start our tour together. Clive is a true gem. He knows every inch of Capetown and showered me with stories, history, political insights, humor and kindness. One of the most memorable days of my life! TOUR GUIDE RESPONSE: Thank you for your truly very kind words. Hopefully we will spend more time together on your next visit to Cape Town. Travel home safely. Clive was wonderful! The cooking tour left me with a part of Cape Malay with a personal touch! I would rate this as 5 out of 5. Thank you so very much! TOUR GUIDE RESPONSE: A real pity that we had such a short time together but I'm real glad that it worked and you enjoyed "The Cooking Class" Thank you for taking the time to post with your busy schedule. Take care of yourself. Amazing tour. Loved every minute of it. Clive was great company, very flexible with the itinerary and came up with some fantastic hotels and ideas for our trip. We would thoroughly recommend him to anyone thinking of travelling the Garden Route. TOUR GUIDE RESPONSE: Thank you for your wonderful comments and so glad you enjoyed the tour. It was very interesting and enjoyable for me as well and looking forward to hearing from you soon and some photos please!! Clive is a wonderful guide and very knowledgeable. Would highly recommend this tour again. TOUR GUIDE RESPONSE: I appreciate your taking the time now to make this wonderful comment. I hope you enjoy the rest of your trip and nice meeting you. We had a great day in Cape Town although Table Mountain was closed and the weather was not good. Clive improvised and we particularly enjoyed the Old Bisquit Mill. Thanks for a lovely day! Clive was a great guide with vast knowledge who customized the tour for our group. I would recommend him n the highest of terms. Clive was an outstanding guide and we became friends after our 3 days together. He was extremely knowledgeable, very caring and considerate, and planned a wonderful itinerary to include all the sights we had missed on previous visits. Highly recommended with no reservations. Worth even more than 5 stars. TOUR GUIDE RESPONSE: You are a STAR. Thanks so much and it was great after the long 2 years wait to finally meet you all. I hope you are enjoying your cruise and a safe return home. Warm regards. Clive is a very friendly tour guide, he works with you from the early morning till night, he will take care for your small details. Very recommended!! TOUR GUIDE RESPONSE: Hi there, Thank you for taking the time to review my services. I look forward to hearing from you in the future and lots of good health. Another great tour with this outstanding guide. Clives' attention to getting it just right for our diverse family group made the tour a highlight for us all. Monday's tour was epic also. TOUR GUIDE RESPONSE: Thank you so much and I hope you had an enjoyable stay for the rest of your time in Cape Town. The weather has certainly been good. Love to all the party. Clive was absolutely brilliant. We booked a half day tour which was worth every $. His informative view on Cape Town was enhance by invaluable insights into planning our next 4 days (must do's as well as helpful tips- for instance we had afternoon Table Mountain tickets and Clive had recommended we go late afternoon to aviod crowds- we had no wait time). With our love of food and wine, Clive booked us at a fantastic vineyard restaurant in Constantia for lunch- a definate must, and even drove us home. TOUR GUIDE RESPONSE: Hi there, Wow, thanks for your kind words and I'm so glad you enjoyed our short trip together. I appreciate your taking the time to comments and as we discussed, next visit will be for longer. Take care and have a healthy & good year. Clive provided a terrific Christmas day tour for our family. On short notice he arranged a terrific city and surrounding area tour including the Penguin Sanctuary, the Cheetah Recovery Project, beach visits, vineyards and coastal drive. He paid special attention to our interests and made adjustments to satisfy our group who range in age from 8 years old to 70 years old. We loved spending the day with Clive. We had the most wonderful tour with Clive. He is very knowledegable and patient, and a really nice guy!. We only had one day to spend in Capetown and Clive organized our day so that we saw the most important landmarks. Our day was packed, from 8 AM to 8 PM. We communicated via email before our visit and told him what we were interested in seeing that was not in the standard tours, and he was able to arrange our day so that we got everything in. He gave us a 5 star tour with 5 star service ! TOUR GUIDE RESPONSE: Thank you so much for your very kind words. I enjoyed our short time together and hope you will visit again for a longer stay. Have a wonderful and healthy New Year. Clive is very knowledgeable and friendly. We really enjoyed our tours and he went out of his way to take us to an American Express money exchange. We even saw him at the gardens the next day while he was with another group. Had a great day with Clive. Highly recommend his tours. TOUR GUIDE RESPONSE: Thank you Guys. Strange to meet again that way. I appreciate you taking time out whilst still in the middle of your touring to post this message. Take care and enjoy the rest of your trip. Can't say enough about how wonderful this tour was. We had a 3-day stopover and Clive helped us make the most of our time. Wineries, game reserve drives, penguins, Cape of Good Hope, and terrific accommodations. Clive is very knowledgeable and made our long drives very entertaining. TOUR GUIDE RESPONSE: I certainly hope our brief tour was informative and your family arrived safely. We enjoyed the tour of the Cape Town and the surrounding area on the 21st. Clive's insight was greatly appreciated. It was nice to get such detailed and in depth information on the different sites we visited all around Cape Town. He was very informative on the politics of South Africa. We plan to come back one day and we will be giving him a call! TOUR GUIDE RESPONSE: Thank you for taking the time for this valued comment and I enjoyed your company during our tour. I do hope to hear from you again in the future. Clive was great, the best choice we ever made! Knowledgeable in so many aspects and fun to be with. Although our trip was (too) short, Clive took us to so many places, immediately understanding what we were interested in, amazed us in his organizational capabilities. We had the time of our life! Beware, Clive, we will be back!!! TOUR GUIDE RESPONSE: Thank you so much for your kind and important words.Really appreciated. Now I'll have to start "preparing" for your return visit so that I'm not caught offgaurd. Keep well and I'm really looking forward to hearing from you as I too enjoyed our travels. Excellent tour. Clive exceeded our expectations in many ways. He was extremely knowledgable regarding African history as well as the geography and the various sights we experienced together. He included sights we had not expected which made our day even more pleasurable. We can recommend him without reservation. TOUR GUIDE RESPONSE: Thank you so much, really glad you had such a good time and appreciate your feedback which is really important for me. Our tour guide, Clive, was terrific. He was quite knowledgable about the history and present day politics of the city and country. He adjusted our tour when necessary due to weather and called ahead to confirm various activities as we progressed through the two days we were in Cape Town. I would highly recommend him. TOUR GUIDE RESPONSE: Thank you for your kind words and I'm so glad your enjoyed the tours. Hopefully we'll carry on where we left off next time. A safe journey home and regards to all. Arranging our tour was the best decision ever for our first trip to Capetown, South Africa. Our guide, Clive, was very good on follow up and was flexible on arranging the drive according to what we wanted to see but also had the best suggestions that we would not have known about. Clive shared history and information as we drove that enhanced our knowledge versus just driving by a building or tourist spot. We felt we had a new friend by the end of the day. Thank you for your company and for Clive. Thanks to Clive I had a wonderful tour of the city and the most delightful evening of cooking and fun! I learned so many recipes and think this is one of the most interesting things someone can do on their visit to Cape Town. Highly recommended! I want to say that my tour guide in Capetown, Clive, was just excellent. He was a nice person and he knew everything. I can highly recommend him. Clive put together a great package for me. A city tour in Cape Town, a visit to a Cheetah Outreach center that included petting a Cheetah, and an overnight at Inverdoorn Private Game Reserve. The overnight safari was everything I'd hoped for and the drive from Cape Town and back was just beautiful. I am currently making plans to return to South Africa and spend two to three weeks next year. Amazing day! Clive catered to our needs - providing water for the bus - adapting the schedule due to the weather and showing us cheetahs, brandy tastings, an amazing lunch followed by more wine tastings!!! Clive was the best tour guide we had on our two-week tour of South Africa. He is intelligent, engaging, considerate and generous. In addition to his vast knowledge of the wine towns and vineyards outside Cape Town, he is a font of information and insights about the nation's economy and government, and places to visit elsewhere in Africa. Indeed, we found him such a pleasant companion and conversationalist that, by the end of the tour, we hated to part with our new found friend. A 5-star guide and guy! TOUR GUIDE RESPONSE: Thank you for all your kind words. It depends a lot on the client and I guess I found you both stimulating enough to bring out the best in me. I too enjoyed our trip together. Lets hope we get to meet again. Keep well and Warm regards. Clive was AWESOME!! He was so good and so much fun we added another wine tour and a trip to Cape Point with him. He is interesting, knowledgeable and fun. We've already recommended him to some friends and they thought he was wonderful as well. Clive is very accommodating and full of ideas. He kept us all happy and our ages ranged from 16 to the 60's! Go Clive! TOUR GUIDE RESPONSE: Brilliant,Lisa thank you and much appreciated. Hope to meet again soon and love to all. We spent a great day with Clive in Cape Town. He not only showed us all of the sights we asked him to show us, but he went the extra mile by arranging for a personal tour by one of the museum's very knowledgeable and interesting guides. He even took us for some authentic and delicious fish and chips at a local riverside spot where we ate with the locals. We recommend Clive without reservation. He is a dedicated and very interesting tour giude. Thanks Clive!